Introduce a new star to your garden with the Starring Tall Bearded Iris. These statuesque irises grows 33 to 34 inches tall and unveil their bitonal flowers in mid to late spring. Ruffled, purplish black falls fan out below starched white standards, which flounce up and out in grand style. Tangerine orange beards contribute a tasteful flourish of colour to complete this chic bloom. Irises enjoy plenty of sun and will thrive when exposed to full sunlight for at least half the day. These sunbathers tend to get thirsty and should be consistently watered throughout their blooming season. 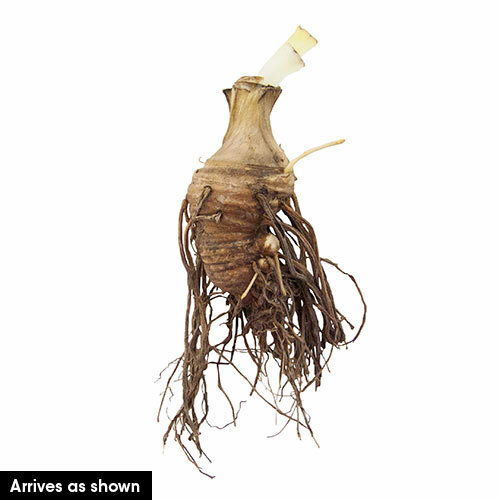 Plant your bearded iris rhizomes in the fall, about 1 inch deep and 12 to 24 inches apart in well-drained clay, loamy or sandy soil. Iris germanica 'Starring' are hardy in zones 4 through 9 and are deer resistant. When mature, each stem will produce five or more luxurious blossoms. Make each stem stand out by planting your Iris germanica 'Starring' individually or in small groups of two to four. These perennial irises also look wonderful in cut flower bouquets. Highlight their brilliant orange beards by pairing them with simple white and yellow daffodils or orange lilies. 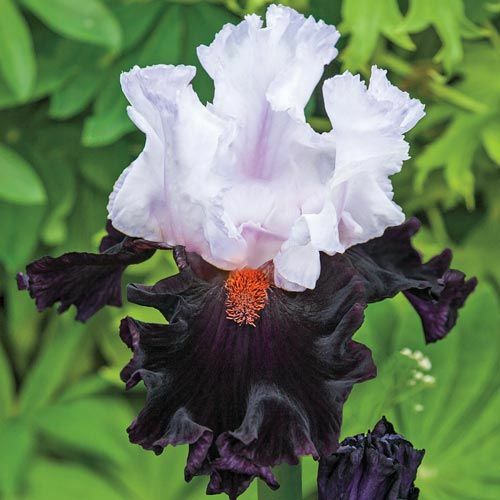 Make your garden the star of the show with the Starring tall bearded iris. Striking bicolour variety for a standout garden! Nearly black, velvety falls showcase pristine white standards for a stunning, high-contrast effect. Bright tangerine beards add a pop of colour to this mostly black-and-white delight.